Chevrolet, also known as Chevy, is an automobile manufacturing company owned by General Motors. Chevrolet is known for producing popular, affordable cars. Chevrolet produces the Corvette, one of the most famous sportscars in the world. Chevrolet was created in 1911 by Louis Chevrolet and William Durant. Louis was a race car driver, and William created General Motors. Chevrolet started using its "bow tie" logo in 1913. It could have come from a wallpaper Durant saw in a hotel. It could also be a version of the cross on the Swiss flag. 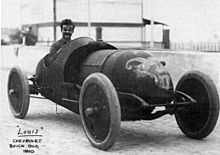 Louis Chevrolet was born in Switzerland. In 1917, Chevrolet combined with General Motors. In 2002 GM acquired the recently bankrupt Daewoo Motors company of South Korea, and in 2011 the brand was folded into Chevrolet making the marque global except for Australasia. The Chevrolet Volt plug-in hybrid is the all-time top selling plug-in electric vehicle in the U.S. Volt sales in the American market passed the 100,000 milestone in July 2016. Chevrolet Facts for Kids. Kiddle Encyclopedia.